Coming up we’ll hear one of the most explosive interviews we’ve done to date. Marc Faber of The Gloom, Boom, & Doom Report tells us why a cashless society will not work and why the mainstream hates gold. Even if you heard my interview several weeks back, I think you’ll want to stick around for my conversation with Marc Faber, coming up after this week’s market update. This trading week is being shortened by the pre-Easter holiday on Friday, although Money Metals is open for business today. But the four-day week still saw gold post its largest weekly decline of the year. Gold prices closed Thursday at $1,218 an ounce, for a weekly loss of 3.0%. The gold market was probably due for a pullback of some significance after going straight up in January and February. Technical selling overwhelmed any safe-haven buying gold may have attracted following the terrorist attack in Belgium earlier this week. Of course, whenever a major event occurs that has the potential to raise fear levels among investors, the plunge protection team, the banking cartel, the powers that be, or whatever you want to call them, stand ready to intervene in markets. The U.S. Dollar Index gained more than 1% on the week, helping to put a damper on gold and the other precious metals. Checking in on the silver market, prices fell 3.7% this week, bringing the white metal down to $15.25 an ounce. Silver suffered its biggest one-day drop of the year on Wednesday after encountering resistance at the $16 level for the second week in a row. Platinum and palladium also each lost ground. Platinum finished Thursday at $950 per ounce for a weekly loss of 2.6%, while palladium gave up 2.4% this week to finish at $577. Investors continue to struggle with uncertainties about the economy and the direction of monetary policy from the Federal Reserve. On Thursday, the Commerce Department reported that durable goods orders for the month of February declined by a seasonally adjusted 2.8%. Continued weakness in the manufacturing sector could squelch demand for industrial metals. Other economic indicators are coming in somewhat more upbeat. Unemployment claims ticked up last week, but economists anticipate strong job gains overall for the month of March. The government also made some favorable revisions this week to employment data going back to 2011. The upshot is that unemployment claims are now officially lower than previously reported. But don’t confuse improvements in how the government officially reports employment statistics with actual improvement in real-world employment. For decades, the government has been severely under-stating the actual proportion of the population that isn’t gainfully employed. Millions of people who are out of work aren’t even counted as unemployed. People who want to work but haven’t had luck finding it for an extended period are statistically expunged from the labor force as if they don’t exist. Unfortunately for them, their monthly bills STILL exist. Yet government officials now have the gall to tell the people who are among the forgotten jobless population that the unemployment statistic has been retroactively reengineered to paint a rosier picture. Another statistic that is constantly being revised and manipulated is the GDP figure. A scathing report this week by CNBC’s Steve Liesman revealed the government’s GDP calculations to be highly unreliable. Steve Liesman: We did an in-depth analysis of the government's reports on Gross Domestic Product and they show large and persistent errors that should give everyone from investors to business executives to policy makers pause in relying on this early data for key decisions. We went back to 1990, we found an average error rate of 1.3 percentage points plus or minus. We also found about 30% of the time, the government gets direction of growth wrong. That is, GDP initially shown to be higher than the previous quarter could in fact be revised to be lower and vice versa. One sort of ironic aspect to all this is there are pretty decent error rates in the government portion of GDP accounts so the government doesn't count the government all that good. The next GDP figure the government reports might not be accurate, but it could determine the outcome of a host of important decisions, including the Fed’s next move on interest rates. Federal Reserve officials appear divided on whether to raise rates this spring, with Fed chair Janet Yellen insisting no decision has yet been made for April. It will be based on the latest economic data, so she says. Yellen insisted at her March 16th press conference that the Federal Reserve is totally data driven and totally non-political. The fact that she is an Obama appointee in an election year where the two leading Republican candidates have called for an audit of the Fed that she opposes… No, no chance that would ever enter her mind when making a policy decision. Not once, not ever! But with presumptive Democrat nominee Hillary Clinton effectively running as an incumbent for a third Obama term, she undeniably has a vested interest in portraying the economy and jobs market as being strong. Stronger than they might actually be in reality. Being an informed voter this election cycle means being skeptical – not just of the promises politicians make, but also of the government statistics they cite. Well now, without further delay, let’s get right to our exclusive interview. Mike Gleason: It is my privilege now to be joined by a man who needs little introduction, Marc Faber; editor and publisher of The Gloom, Boom & Doom Report. Dr. Faber has frequently appeared on financial shows across the globe and he's a well-known Austrian school economist, and an investment adviser. It's a real honor to have him on with us today. Dr. Faber, thank you so much for joining us. Marc Faber: It's my pleasure, thank you very much. Mike Gleason: Well, I want to start out by asking you about the current state of the financial world here in the early part of 2016. What do you make of the market action here, so far this year? Marc Faber: Well, basically, the financial markets have been sick for quite some time. Emerging markets either never made a new high above the 2006, 2007 highs, or they peaked out in 2011, or some even later in 2014. Basically after about February/March 2015, they started to drift. And in the U.S., the indices were strong, but the average stock was down substantially in 2015. This is called weakness beneath the surface of the indices because an index, theoretically, could have 500 stocks and 499 decline, but one stock goes up a lot and drives up the index. So this happened last year, to some extent, in the U.S... you have the strong stocks, Facebook, Amazon, Netflix, Google, and maybe another 20 stocks that were going up. And at the same time, you have thousands of stocks that were acting badly and going down, which accounts for actually a horrible performance for most investors. Now in January, reality set in with the strong stocks, they're all down 20, 30, and sometimes even more percentages. Mike Gleason: Gold has been rallying in dollar terms lately but it has done much better in terms of many other major fiat currencies. The U.S. dollar has been remarkably strong in the past year, although it's finally showing some signs of weakness. What are you expecting over the coming year in the currency markets? Is the dollar going to head higher still or do you see it rolling over? Marc Faber: The question should be, "Which central bank is the most insane?" Because you understand, the central banks have been manipulating just about everything. They manipulate the currencies, they manipulate interest rates, they manipulate stocks. It's interesting sometimes if you observe in the U.S., when the market is very weak overnight, in other words the S&P futures go down 20, 30 points, suddenly, a buyer emerges and pushes up the market. I believe that the Fed has not just intervened in bonds through Operation Twist, in interest rates through QE programs but occasionally they step into the stock market to stabilize the market and try to push it up. I think other central banks around the world ... in Japan, they announce it, the central bank, the Bank of Japan, is buying shares through ETFs. So there's a gigantic manipulation and you and I, as an investor, we just don't know how far these insane people will go with the manipulation of markets. Now, already 7 trillion dollars' worth of pounds are trading at less than 0 interest. The talk is that, even in the U.S., they might introduce negative interest rates. Negative interest rates will not help the world, I guarantee you that. Mike Gleason: Furthering the point there, let's talk about the war on cash for a moment. We have negative interest rates coming into the picture, as you just mentioned, with our own Fed telling U.S. banks to start thinking about how they would handle negative rates. Meanwhile, we're seeing people who want to deal in cash, withdraw their cash, even deposit cash, getting hassled in various ways. Why do you personally think that cash and cash holders are increasingly disfavored by the financial establishment? Marc Faber: Well, it's clear to me. If you look at the world over the last 100 years, you have a group of people that want to have more and more control over you and me. They want to know where you are, what you do, what you're looking at. Basically, we're moving into an Orwellian society where they can check everything. And cash will still be one of the means where you could go somewhere and buy something and nobody would really know about it. Now they want to abolish it. Of course, if you have negative interest rates, you want to essentially prevent people from hoarding bank notes in their face at no cost. So you want to deprive them of that privilege, of that freedom, so you introduce a cashless society. In my opinion, it will not work, and let me explain to you why. Let's say you and I live in a small town of a thousand people and suddenly the government says, "No more cash." Say, I'm the baker and you're the butcher, and a friend of ours is the pharmacist. We can then barter among each other and effect the balances every month or every 3 months and so forth. Then, some kind of paper money comes back up. These are vouchers. So the war on cash would have the exact opposite effect. You will have a voucher system in every small city, and even in big cities, some smart people will develop the voucher system. So instead of having just one currency, paper currency, you'll have hundreds of paper currencies. Number two; if they want to really launch a cashless society, they would have to take your gold away. That, in some countries, will simply not fly. In other countries, a cashless society is simply not practical because 80% of the population doesn't have a bank account and doesn't have cash to start with. So in my view, this cashless business is going to fail very badly. The argument is, of course, "Oh, we want to move into a cashless society because we want to prevent criminality." This is all nonsense. They want to move into cashless society so they can control you. Mike Gleason: Deutsche Bank has been the subject of major concern. The share price continues to fall and the CDS market indicates default risk at the bank is rising dramatically, but it isn't just Deutsche Bank. The markets suggest risk is spiking for a long list of the largest U.S. and European banks. The potential problem is huge, given that many of these firms are much bigger than Lehman was and they carry even more derivative exposure. How concerned should people be about this? Do you expect problems imminently or is there a good chance this will blow over? Marc Faber: Well, I have always maintained derivatives will not exist forever. Eventually, there will be no derivatives and we'll start a new system, which is based on, say, gold or another currency that cannot be multiplied by some academics at the central bank. I mean, when you think about it philosophically, now we have 5,000 years of human history from the old days in Babylon up to today that has been recorded. Never, ever before have interest rates been this low. Never, ever before have we had negative interest rates. This has all been created by some mad academics that populate the halls of glass buildings called central banks. This is now really a disgrace to humanity that in democracies in particular, we give so much power to these people that basically rule the world to a large extent. Marc Faber: Well, if you tried to eliminate risks, eventually you have a systemic risk. That was already the view of Karl Popper. But I'd like to make this observation; say, today, the bonds of Deutsche Bank rally strongly and the stock is up something like 12%. Deutsche Bank announced that they will buy back some bonds. Now when you think it through, with whose money? They have a capital shortage, that's why the stock has collapsed by more than 80% since the financial crisis in 2007. The reason they can buy back bonds is that someone is lending the money. But why would anyone lend them the money to buy bonds that essentially that have collapsed this year by something like 20, 30%? Who is lending them the money? The central bank of Europe, the ECB, or the Federal Reserve, or someone innocent. What will eventually happen is a crisis that brings down central banks. But I don't know when, but it's going to happen. Mike Gleason: It definitely does seem inevitable. They can't keep going on in the current path forever. Switching gears here a moment, any thoughts on the U.S. Presidential election? What do you make of all the success of the anti-establishment candidates on both sides of the spectrum? Marc Faber: Well, I think that the American people have figured out that both the Democrats and the Republicans are one in the same mafia family. They protect each other. Both parties know so much dirt on each other that they never speak about it. So there is a status quo, it's no progress at all. Because they each have something on each other and so the independent candidates who, I'm not sure they will do it, but at least they tell the voters, "Listen, we're going to do something different." And I believe actually that both Sanders and Trump, especially Trump, because he must be very angry at the wealthy Republicans that are so much against him, he's going to go after them. And Sanders, I believe him, that he's going to go after the big banks and Wall Street, because they have really, in good English, screwed the man on the street. What exactly the outcome will be, and whether they will be elected is another question because the establishment both on the Democratic side and the Republican side will fight like mad. Mike Gleason: You've lived in Asia for a number of years now, so there aren't many better to comment on the dynamic of the global shift that's going on from West to East. In terms of China, they have been very active participants in the gold and silver markets and have been big accumulators over the past several years. You even wrote a book about this 14 years ago, about how that region of the world was going to be discovering gold and boy, was that prophetical. So talk about what the Chinese are doing there and what do you think they're trying to position themselves for as we move forward here? Because a lot of gold is moving from what seems to be weak hands in the west and into very strong hands in the east. What effect will this have on the future? Marc Faber: It's very clear that Asia, with more than 50% of the world's population, has been growing very rapidly in the last 30 to 50 years. China, in particular, over the last 20 years. China, with 1.3 billion people and India, with 1.2 billion people are very important countries, economically. And if you look at the standards of living of people in the west, in other words western Europe, the U.S., and I include Japan, are no longer rising but going down for most people. Whereas in the east, I can say that since I arrived in Asia in 1973, just about everybody enjoys a better standard of living. Just look at, say, Chinese. Until the mid 80s they couldn't travel and then in the early 1990s, there were about 3 to 5 million Chinese travelers overseas. In 2000, there were 10 million Chinese travelers overseas and now there's a little bit less than 120 million Chinese traveling around the world. So there has been a huge improvement and there has been an increase in their economic power. The Chinese, for some reason, believe in gold. My sense is that the Chinese would like to eventually have the world's dominant currency, in other words, replace the dollar as the reserve currency of the world. Whether they manage it this time, I'm not sure, because right now, China has also some of its own problems. But I'd like to tell you, if I have to choose between the problems of western Europe and the U.S. and China, I'd take the problems of China any time. Mike Gleason: What happens when the West runs out of gold to sell to the East, to China? We talk about currency wars and what may develop there. Would that be one of those potential tipping points if all of a sudden western vaults are completely just wiped out and there's no more gold to send over there? Because you got to think it has an exhaustion point based on how much they're accumulating and how much of the West's gold they're taking. Marc Faber: Well, I think it will take a very long time until most of the gold has shifted to Asia, but I'd like to clarify one point because there's a misconception about currency wars. In the Fed's statutes, there is a paragraph that says that one of the Fed's mandates is to coordinate – well understood, coordinate – monetary policies with foreign central banks. I'd like to emphasize that the Federal Reserve talks every day to the Bank of England, to the ECB, and to the Bank of Japan, and that they coordinate monetary policies. Now, I don't believe that they talk every day to the Bank of China and to the Russian Central Bank. That I doubt, but basically among the industrialized block, Japan, Britain, Europe, and the U.S... the so-called allies of the U.S... they coordinate monetary politics. Now, how long this will work and to what extent there is a currency war, basically what happened is that some big hedge funds, including George Soros, were shorting the Chinese currency. And I don't think that the Chinese want to be held hostage by some speculator. Thereafter, suddenly the U.S. dollar began to weaken. You understand, the Chinese basically, they have sufficient reserve where they can basically dump U.S. dollars into the market and depress the value of the U.S. dollar. At the same time, they can embarrass, say, the Bank of Japan by pushing up the value of the yen. So I believe it will become very interesting, what happens internationally. We have this colossal liquidity bubble that was created through printing. Mike Gleason: A few years ago, you had a funny exchange on CNBC with anchor Maria Bartiromo about gold, which really underscores the mainstream's view. For those who haven't heard it, let's have a listen to it and then I'll have you comment. Maria Bartiromo: You said a moment ago, "Markets go up and down." The dollar goes up and down, stocks go up and down and yet, you also say you will never stop buying gold. So what's behind that strategy? Doesn't gold go up and down too? Marc Faber: You see, I want to tell you something, Maria, about gold. I buy gold because I'm fearful that we will still have a systemic crisis, that we will have wars and so forth in sum. So I'm buying gold because I'm fearful. I'm sorry to say, Maria, you don't own any gold and you are in great danger because you don't own any gold. So I'm fearful and I own gold, and you are in danger because you don't own any gold. Maria Bartiromo: You don't know that I don't own any gold... actually, you're right, I don't own any gold. Okay, guilty as charged, I don't own any gold. Mike Gleason: (laughing) I just loved that. So why is it that most don't understand gold and are so often quick to ridicule those of us who believe in it and view it as real money? 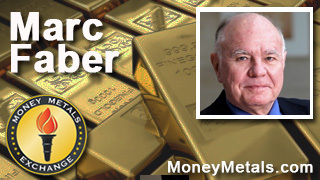 Marc Faber: Basically, gold is an honest currency. You can increase the supply somewhat through the opening of new mines and the exploration and the discovery of new deposit, but you cannot print it and double the supply of gold overnight. That simply doesn't exist. And that quality of gold being a store of value is a disaster for the interventionists that we have at central banks and, by the way, in government. Because if you look at, say, government in 1900 and today, in 1900, U.S. total government expenditure as a percent of the economy were less than 8%. Today, they're over 40%. So do you understand... the government is not representing people anymore – this is what we discussed before about the good showing of Sanders and Trump – but the government is representing itself. It is eating at the economic cake and by eating too much of the economic cake, the remaining economy, the private sector, cannot grow fast enough to boost overall growth rates. Because the government doesn't do anything to boost growth. It actually is growth-retarding with regulation and laws and all kinds of things. So basically, everybody – the media, the government and in the financial sector – detests and hates gold because it's honest. The whole financial sector, they love money printing, and let me tell you why. Each time the market goes down, whether after March 2000 until 2002/2003, or after 2007... if the markets didn't recover, the financial sector would earn late fees because they are paid according to the asset values and they're paid according to performances. They love money printing and these are the people that are being interviewed on TV, you understand? Mike Gleason: As we begin to close here, what advice do you have for that common man, the electrician and so forth... the people out there who are trying to protect themselves? Both those who may already own gold and silver, and those who don't or those who are on the fence about whether or not they ought to have some. What advice can you share for those folks? Marc Faber: Well, basically, I think the issue is really, if they introduce a cashless society, I think it's going to be very likely that the government will try to take the gold away from you. Now, in 1933, this happened and then the government collected the gold and they paid you $20 an ounce. After they had collected all the gold, they revalued it to $35 an ounce. Nowadays, I'm not sure whether that would fly, but one thing is very clear. In the 1930s, it was easier to hide gold. You could buy it and essentially put it a hole in your car or a safety deposit box at home and so forth. Nowadays, with metal detectors and all kinds of devices, it will be difficult to hide gold. Equally, if you walk through an airport, probably it's easier to hide some stamps and diamonds than to hide gold, which would respond right away to a metal detector. So I think it's important for people to think, "If I have a lot of gold, where do I want to store it?" I would say probably gold stored in Asia is in a better, safer place than stored in the U.S. or even in Europe. (Mario) Draghi is basically working with the Fed so if they collect the gold in America, it's likely they will do the same in Europe. Mike Gleason: As we always advocate, just keep your gold and silver in your own personal possession, don't put it in a bank safety deposit box or anything like that. Have, at least a good portion of it where you can get your hands on it if and when you need it. And beyond that, if you have more than you're able to store yourself seek out a private depository that is outside the banking system – perhaps in a place like Asia for instance like you mentioned. But keep most of what you own within close proximity for sure. Marc Faber: Well it's my pleasure. I have a website called GloomBoomDoom.com, or you can just Google my name and then it comes up, GloomBoomDoom.com. Mike Gleason: It's been a real honor to speak with you, Dr. Faber. I hope we can catch up with you some time again in the future and I wish you a great weekend. Thanks again for joining us. And don't forget to check back here next Friday for our next Weekly Market Wrap Podcast. Until then, this has been Mike Gleason with Money Metals Exchange and have a great weekend, everybody.